:: Adeeology ::: WinSCP on Linux? Use FileZilla instead! After I deciding to move my programming environment from Windows XP to Ubuntu 11.10, I need to find some tools on Linux to support my daily jobs. In addition the tool should be Open Source / Freeware, and another concern is I really avoid using Wine to run Windows applications because I personally think the is not so stable and some of thems looks bad. I tried to find an equivalent tool for WinSCP (a SSH File Transfer tool for easy copy files from / to the server development), I have tried some applications like Midnight Commander, SecPanel, muCommander but nothing as good as WinSCP. An unexpected solution, we actually can use FileZilla, the popular applications for the FTP client for SSH File Transfer such as WinSCP does. As shown above, fill in your Host address, Port : 22, and for Protocol, choose SFTP - SSH File Transfer Protocol. Also put the User & Password information on the fields. Hit the Connect button, and you're done. 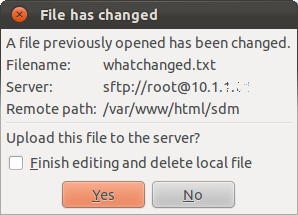 On thing I like from FileZilla, it'll tell us if a file (between local and remote site) has changed. And it'll offer us whether to synchronize it or not. Nice!